I am working on a Illustrator file that I need to export to Photoshop to edit. When I'm exporting it changes the color of my black and it becomes quite dull. The same thing happens when I export it as a PNG from the Photoshop file. I know my Photoshop file is in CMYK and I am wondering how to have the black output like it was in Illustrator, or is it normal to see it this way? I am not used to work with those programs so sorry in advance if I can't understand your answer. It sounds like your issue is coming from your settings for viewing/exporting blacks. In the image below you can see the difference between backs. A black with the CMYK values of 0-0-0-100 is known as registration black. 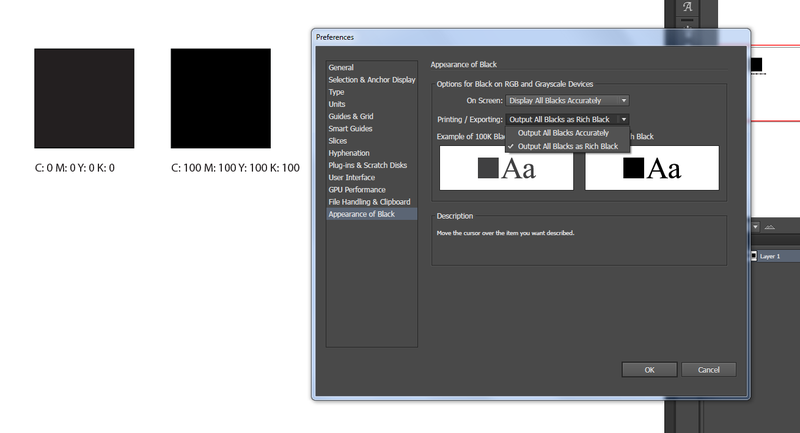 And a black with the CMYK values of 100-100-100-100 is known as 4-color black. Your issue sounds like you have the top setting as display all blacks as Rich Black but the Printing/Exporting setting as Output all Blacks Accurately. Open Bridge. To open Bridge from a Creative Suite application, choose File > Browse. To open Bridge directly, either choose Adobe Bridge from the Start menu (Windows) or double-click the Adobe Bridge icon (Mac OS). Not the answer you're looking for? Browse other questions tagged adobe-photoshop adobe-illustrator color export color-spaces or ask your own question. Why do colors output differently when I print within InDesign compared to printing within Photoshop? Why is my text blurry when I transfer it from Illustrator to InDesign?